Nestled in midst of busy Downtown Fullerton, The Villa Del Sol is a Spanish colonial oasis that feels like you are stepping into another world. This historic landmark boasts rich architectural elements that sprawl around a central courtyard where a burbling fountain and Spanish tiling create a captivating backdrop to your wedding ceremony and reception. 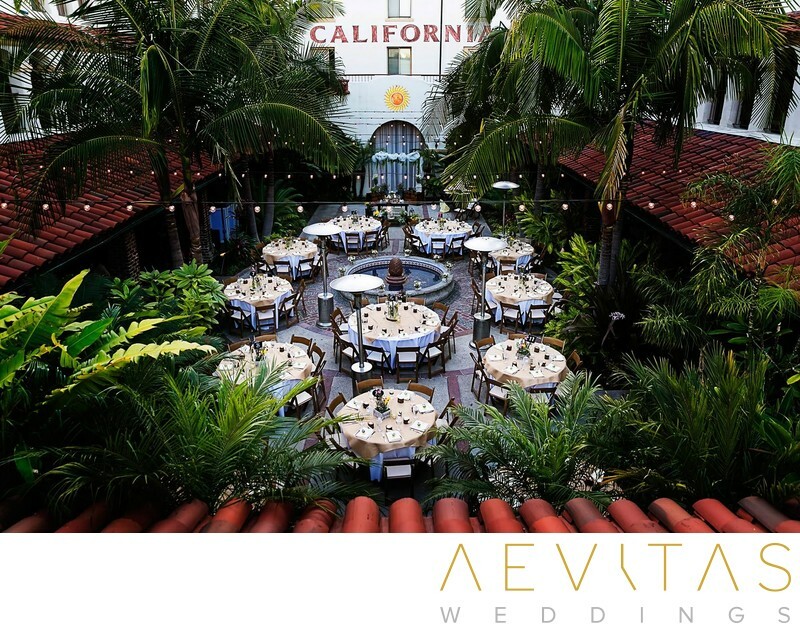 Palm trees and landscaped gardens provide a tranquil setting as you exchange vows in the courtyard, watched on by family and friends, then head upstairs to the ivy-covered balconies for cocktail hour while the staff transform the same space into an elegant reception venue. There are rustic features, such as wrought-iron railings and archways, for capturing couple portraits, bridal party portraits and family formals, as well as elevated vantage points to photograph your event from multiple perspectives. Alternatively, you can step outside to incorporate the more local, urban atmosphere of the surrounding streets in your wedding day photos. By night, the courtyard reception space is beautifully adorned in fairy lights that create a romantic and festive atmosphere, while a sweetheart table at the front is an intimate space for just you and your loved one. Wine and dine under the night sky then dance until the early hours on the open-air dance floor. The Villa Del Sol has a range of catering vendors you can choose from, allowing you to customize the menu and dining style to suit your individual tastes. With BYO beverages as well, this enables plenty of flexibility to create an event that is exactly what you want. The Villa Del Sol can accommodate up to 250 guests, but is also ideal for more intimate wedding celebrations with just your closest family and friends. It is the perfect setting for couples wanting a one-stop wedding location with a distinctly European feel, whilst still being within easy access of Los Angeles and its surrounding cities.